55,000 reasons to thank our supporters! The Universal Promise Rotunda 2018 counting is over, and the answer to the question is YES! YES! YES! YES! We reached our $40,000 | 4,000 book goal for the Vusumzi Primary School Library and then some! In fact, we raised more than $55,000 that night, a sum that far surpasses any one-day total for any event in our short history. For our South African friends out there, that amounts to a whopping 800,000 Rand! Many thanks to ALL of you for purchasing tickets, showing UP, shopping, bidding, dancing, sponsoring, and exuding great energy! We were hopeful that we would fill the beautiful space that is the Rotunda, but we also knew it would require that we sell a record number of tickets; we believed in you, though, and you came through, as you have again and again and again. Thank you to all our young volunteers. We could not have done this without you. The feedback about you has been tremendous, and we so appreciate your infusion of youthful energy and vision into our efforts. The UP impact is solidifying its future because of you. Feed the senses, and you feed the soul! From the visceral beauty of the Sidy Maiga Band and its astounding musicians from Mali and Senegal, to the fabulous DJ Jalen Young, to the deliciousness of the Kitchen Companion catered food, the South Africa wine purchased from Allen's Wine and Spirits, and the local beer provided by Mission, to the cool, experiential nature of the auction and raffle items, to the teamwork and support of the Rotunda personnel, we had it covered! Above all, on behalf of all those affiliated with Universal Promise - from earnest South African kindergarteners to our Ilizwe crafters - thank you for your financial sacrifices, empathy, and ubuntu. Ubuntu. I am because of you. Nothing feels better. Vusumzi Primary School students: uniforms done right! We agree. Victor captured perfectly what we witnessed in August 2018: that nearly all of the 750 Vusumzi children now sport a full school uniform, and we have a lot of people to thank for that. First, we are indebted to our unparalleled Inkuthazo sponsors, who make up the backbone of many of the transformations at Vusumzi and beyond. In fact, Inkuthazo sponsors had single-handedly fueled this effort since 2011. In June 2017, however, UP warmly welcomed the compassion and actions of volunteers Ally Marrinan, Jane Gudoian, Madi Aumann, and Maggie Stark (left), who reached into their pockets to apply immediate relief. The truth is that the most loving and devoted guardians often face serious financial obstacles, and they sometimes have to choose between feeding their families and outfitting their children for school. In March 2018, Ally, Jane, and Maggie were joined in this effort by Newport’s St. George’s students, who were on the lookout for uniform inequities. Five months later, Anja Bjornson also made it a goal to have each Vusumzi child arrive at school in the classic green & gold. Maggie even took it upon herself to reach out to family and friends to contribute, and they came through. In sum, UP has overseen the purchase of scores of uniforms funded by targeted donations, volunteer gifts, and Inkuthazo. With a system now in place to determine, record, and follow up with the children and families in greatest need, Vusumzi boasts a climate that uniforms are intended to create but often fail at ensuring: more confidence and less shame for children. What’s not to love about that? For more information about Inkuthazo, please click here. While Jonathan and Ruth Appleyard were planning a once-in-a-lifetime trip to South Africa, they knew something was missing, something that transcended the well-trod tracks of tourism. They yearned to feel and live and taste a country in churches, in schools, in townships, in the presence of locals. The Maine residents' wishes were swiftly fulfilled through a visit to Brunswick's It's All Good, an upscale resale shop whose steadfast philanthropy funded and subsequently upgraded a green, clean water system at Vusumzi Primary School, a focal point of our efforts. A chat with owner Cindy Neprash led the Appleyards to UP, which set off a chain of phone calls and itinerary-drafting. In a blink, the Appleyards found themselves in UP's South African happy place. Shortly after returning home from South Africa, Jonathan and Ruth reached out to us to ask, "What is the greatest need? Where may we be of the most help?" Completing the Vusumzi Primary School kitchen was our answer, and that was all they needed to hear. Within days, the Appleyards sent out a plea to family and friends, and the checks started arriving. More than $4,500 rolled in, which meant that just a few weeks later, the rejuvenation was unfolding: a refrigerator, a freezer, a water supply, storage shelves, cabinets, and scores of cooking utensils to add to the tiling and electricity. You never know the power of graters, parers, large forks, knives and spoons, storage containers, dishcloths, and mixing bowls until you see them in action, all in the skillful hands of the always hard-working and now joyful Vusumzi Primary School kitchen staff. During a recent UP Board Meeting, Charlie Josephs said, "The kitchen is beautiful. This project dramatically improved a major issue: hygiene. It is clean, properly outfitted, and fully functional. I remember the Appleyards well. Please convey to them our gratitude for their vision and leadership and generosity." We believe that one side of the volunteerism coin allows us to be privy to the lives of those we serve; the other side is less traveled. It is the one that compels us to continue serving once home. To Jonathan and Ruth Appleyard, and to all those who donated to this transformative cause, we join 750 Vusumzi Primary School students, their parents, and their educators in thanking you. You saw something, and you did something. We treasure those who choose that path. To donate to Universal Promise and to embrace its mission of education for all, click here. There is often disbelief among those we serve: a confusion, almost, about why strangers reach out to help those they may never meet. American generosity is a phenomenon. We are often ranked number one in the world for giving. Why? One theory is that winning the David and Goliath battle for freedom against the British in the Revolutionary War fuels our fondness for the underdog. Regardless of the reason, we are pleased to share with you the generosity of Lori Bourgeois, owner of At Last...Salon & Day Spa in Brunswick, Maine. Each year Lori selects an organization to support through a silent auction event in her spa. She canvasses the community and gathers a fabulous array of items from local, philanthropic business owners and managers. This year we were THRILLED to learn that Lori had selected Universal Promise, and just yesterday we received the fruits of her labors: $1,606! The entirety of those funds will go straight to our Vusumzi Primary School Library Fund, which will bring a first-ever facility, with 1,000 books per grade level, to a community craving access to books. To Lori and all her partners-in-goodness UP in Maine, we thank you for supporting our mission of education for all, and for shedding light on the ripple effects of kindness on children-in-need. Thank you, MAINE! I no longer say I have a dream. I say I have a plan. In November 2010, Martha T. Cummings, UP Executive Director, traveled to Motherwell Township, South Africa, to visit her friend, Ndumi Tutani, a masterful educator. At one point in the visit, Ndumi singled out Grade 9 student Nosipho (pictured left in 2018) as "someone special," so Martha spoke with Nosipho and encouraged her to work hard and get in touch when she had finished Grade 12 and passed the matric, the requirement for studying at university. Nosipho said, "I promise I will. I promise." Before Martha left, she photographed Ms. Tutani with Nosipho, asked for Nosipho's address, and told her she would send her the photo as a reminder of her "promise." And that was that, right? No. Three years later, Martha went to her mailbox in the USA one day to find a letter with a return address she did not recognize. It was from Nosipho, who had written to tell Martha that she had worked hard, had taken the matric, and believed she had passed - but she would send her results when they arrived. Days later a second letter appeared with her matric certificate inside. Nosipho was heading to university to study Accounting. Nosipho soon applied to and was accepted into our Uphuhliso program, which - thanks to her loyal sponsor - has provided her with scores of supplies to assist her at university: anything from pens and paper to a laptop. Each time, without fail, Nosipho was gracious and grateful and assured us that, although the field of Accounting was difficult, she would pass. It turns out, though, that she has not merely passed. In fact, in a recent phone call with UP, Nosipho revealed that the Head of Taxation at University of Fort Hare (Nelson Mandela's alma mater) recently honored her for earning Top Marks in Taxation 3 (left). During that same phone call, Nosipho also discussed a portion of her Uphuhliso application that read, "When you return from university, what will you do to give back to learners in your high school?" In June 2018, Nosipho visited her old school to meet with Grade 12 learners. "While their university applications had been completed, they did not have any knowledge about how to fund their studies further. So I volunteered myself to help them on anything that they will need." At the very end of our recent talk, Nosipho said, "I no longer say I have a dream. I say I have a plan." Ahh. Those words warm UP our heart. If you would like to be a part of these efforts and amazing outcomes, please click here to let us know. 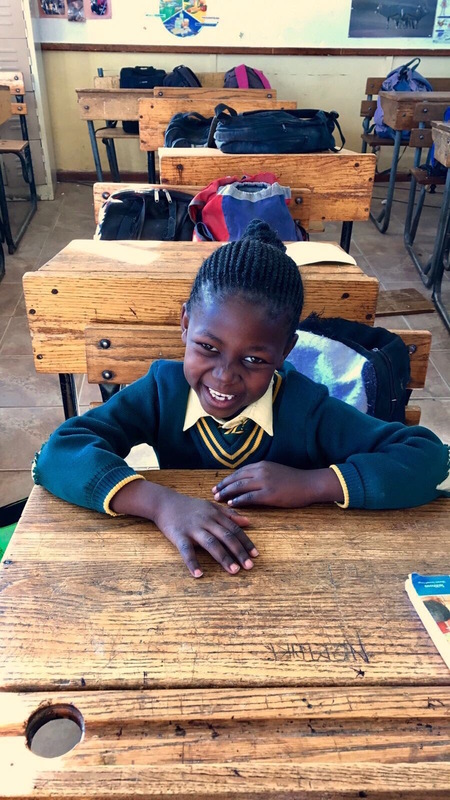 Universal Promise calls on scores of supporters, both in South Africa and in the United States, to carry out the mission of education for all in Nomathamsanqa, South Africa. At this very moment, staff on two continents are all abuzz collaborating on a kitchen renovation for 750 students as well as the designing, furnishing, and purchasing of materials for four unprecedented spaces in the brand new Academic Centre: a library, science lab, arts studio, and music & dance space. On top of that, as the infrastructure renovations wind down at Vusumzi Primary School (after a crazily fruitful seven years that brought an impressive range of improvements, from a state-of-the-art computer laboratory to clean water), the professional development focus is ramping UP. Educator and student mastery of the Internet, hands-on lessons plans, and differentiated learning are taking center stage in the VPS evolution, and we are devoted to supporting the educators and learners 100% as they take on these increasingly creative and rewarding methods. So, to whom did we turn for support as this exciting movement unfolds? Career educator and administrator Karen Cotter! Karen traveled with UP in March 2017 as a triple threat: an Uphuhliso sponsor, a crafter, and a professional development expert. Based on her impact in 2017, we thought Karen would have a wealth of knowledge, and we were right. In short order, Karen created a VPS Google Sites domain, which highlighted an immediately applicable collection of interactive classroom activities and teacher-support websites. VPS educators have already begun to utilize the site to move outside the classroom to explore the nuances of soil and the qualities of water. Those online resources will only expand in August 2018, as UP volunteers work with VPS educators to add to the VPS Google Site Karen created. In the name of sustainability, that is, in fact, UP's and Karen's wish: that the educators take control of the site and put their thumbprint all over it. UP offers its sincere thanks to Karen for immediately saying "YES" to our plea and to going beyond the call of duty. Karen has clearly kept the South Africans in her heart, and we are grateful for her ongoing volunteerism, even from thousands of miles away. Now we will turn to her for an Ilizwe Empowerment crafting project. That is the beauty (and danger) of being a triple threat, dear Karen. Ani Ayvazian-Hancock (pictured left with her proud mother) is a junior at St. George's School and was part of the group that volunteered with UP in South Africa in March 2018. While in South Africa, Ani saw for herself that the UP mission of education for all is thriving. All our programs, which respect the local culture by honoring home-based and school-based empowerment, resonated with Ani. This compassionate, determined, young woman inherently and instantly understood the power of sustainability. At the same time, Ani also understood something equally significant: out of respect for those who welcomed us into their world of ubuntu, we must continue to connect with our South African friends long after our return home. While in South Africa, Ani taught interested crafters how to knit. Within one hour, Ani had all the crafters, including Nothemba, Linduxolo, Nombulelo, and Ntombinzanele, pictured above, casting on like pros and enlarging the scarves stitch-by-stitch. Two days later, with the scarves completed, Ani taught the group how to cast off, and, because of Ani, Ilizwe crafters had learned yet another skill that will lead them to financial independence. But that was not enough for Ani. Upon her return to the USA, Ani immediately proposed to the St. George's community that she spend her afternoons knitting products to sell to her teachers and fellow students, with the profits to support the project back in South Africa. Then she got to work. Hour-after-hour and day-after-day, Ani demonstrated through her actions and her time that she had not forgotten. Then, on May 18th, Ani presented the fruits of her labors at a school gathering (left), at which she shared memories of her experiences in South Africa and displayed her beautiful creations - colorful and numerous scarves and hats - which sold out in one hour. Ani, in turn, donated the entirety of the proceeds and the unused yarn to the grateful women of Nomathamsanqa. UP is repeatedly heartened by the compassion and foresight of those who are determined to forge a more connected and empathetic world. All of that takes time, however, and perseverance, and Ani exhibited both those qualities in South Africa and back on American soil. Ani, UP expresses its heartfelt gratitude to you for your devotion to the crafters, their families, and their pursuit of the opportunities that lead to justice, civility, and hope. On March 8, 2018, hundreds of Nomathamsanqa residents gathered to open the brand new Universal Promise Academic Centre at Vusumzi Primary School. The idea for the new facility was born after UP founder Martha T. Cummings had a fortuitous encounter with head waiter Moses Mzolisi Nqontsha in 2008. Ten years later, after scores of other UP-funded improvements to VPS, the building was completed and has taken its place as the "talk of the township." The center will house a school library, a science laboratory, a music classroom, an arts studio, and a main, central, open-air space that will accommodate dining, after-school tutoring, meetings, and performing arts. At the handover ceremony, Universal Promise announced the naming of the central hall after Nqontsha. As Cummings said, "All discussion surrounding the transformation of Vusumzi Primary School must start with Mr. Moses Mzolisi Nqontsha," who accompanied her in 2008 to the heart of Nomathamsanqa. At the time, "Vusumzi School was a glaring reflection of the aftermath of apartheid, and Moses’ shame that day was apparent, yet he remained dignified. "Despite all the years of waiting, the unrealized promises, the systemic subordination that still affects too many children’s pursuit of fairness, Moses was hopeful. He remained a man who wanted one thing: to free himself and others from the aftershock of apartheid so that his children would earn the kind of education that would allow them to expect better and to demand more." The Port Elizabeth Herald picked up on the story and arrived to capture the rare relationship between Nqontsha and Cummings and the fulfillment of a promise to students, educators, and residents of Nomathamsanqa. Cummings said of the ceremonial opening, "Sometimes you just know you’re living an epic moment when you’re in the midst of it. Today was one of those days." Mr. Nqontsha wrote, "Thank you for making me so happy. It was the greatest time ever in my life. I will never forget this. Ever." Universal Promise will remain forever grateful to Moses Nqontsha for agreeing to accompany us that fateful day. You just never know what will come of saying yes. In March of 2018, 15 students and two educators from St. George's School (SGS) in Newport, RI, as well as two Universal Promise volunteers, landed in Port Elizabeth, South Africa, before heading north to Nomathamsanqa, Addo, to visit our favorite school: Vusumzi Primary. The VPS community, once again, welcomed Universal Promise and its volunteers with kindness, professionalism, humor, and gratitude. As a result, the SGS students instantly and seamlessly immersed themselves in the experience, from their welcome by a host of traditional Xhosa dancers to their heartfelt concern for all VPS learners to their impact on their tutees to their emotional attendance at the handover ceremony of the Universal Promise Academic Centre. Prior to our arrival, each VPS educator had graciously agreed to co-teach with an SGS student and to share strategies, improve the teacher-to-student ratio, keep an eye out for particularly advanced or struggling students, and make note of any learners who were attending school without proper uniforms, so that we may intervene on their behalf. In addition, the SGS students were responsible for developing an after-school tutoring program and for collaborating with local crafters to learn the projects the women had been mastering week by week. At the end of the trip, SGS volunteers left Nomathamsanqa with full but heavy hearts - knowing full well that they were saying goodbye, at least for a time, to the most warm, welcoming, talented, and beautiful human beings they had ever met. Universal Promise had high expectations for this volunteer adventure, and it is not an exaggeration to say that the SGS students and chaperones met and then exceeded those expectations. We are grateful to SGS for having reached out to UP for a potential partnership and then worked with us to bring this trip to fruition. We know the experience is etched in the minds and hearts of students and educators on both sides of the Atlantic Ocean. Above all, we feel fortunate to have bridged a gap between students in South Africa and those who hail from a boarding school in Rhode Island (but who represented China, South Korea, and the United States). Such cross-cultural exposure lays the groundwork for a world that is less concerned with borders and differences than with global responsibility and similarities. We feel honored to have played a role in encouraging young people to get hooked by a life of service - a life of understanding the challenges that others face and the benefits that others inherit by virtue of their accidental place of birth, skin color, or gender. After what we witnessed this past March, we feel even more confident that the future will inspire and broaden the kind of inclusivity and compassion that thrives in the South Africans we serve.